This oped co-authored with Mark H. Tuohey, a partner at the Washington, D.C., office of Brown Rudnick LLP, originally appeared on GlobalPost. 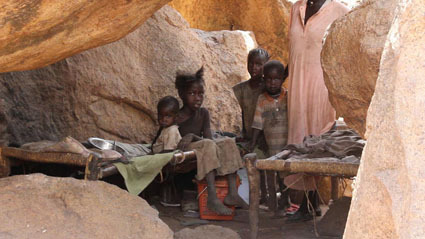 Thousands of innocent civilians are living in caves in Sudan’s Nuba Mountains, hiding from government bombs and on the brink of starvation. Hundreds of thousands are stranded in refugee camps in South Sudan or Ethiopia. These individuals are fighting for survival and are unable to bring their grievances against the government of Sudan before domestic, regional, or international judicial or political institutions. That is why this week, when the African Commission on Human and Peoples' Rights convenes for its 51st ordinary session in the Gambia, it will consider a petition against the Republic of Sudan filed by the Enough Project. The petition seeks to bring attention to the widespread human rights abuses that the Sudanese government is perpetrating against its own people in the states of South Kordofan and Blue Nile. The petition alleges that the government of Sudan’s intentional bombing of civilians and denial of international humanitarian aid to populations living in the two states constitute violations of, among other things, the rights to life and property afforded these civilians under the African Charter on Human and Peoples’ Rights (the "African Charter"). The government of Sudan’s violations of the African Charter come amid ongoing conflict between government forces and the Sudan People’s Liberation Movement-North ("SPLM-N"), an insurgency group with historic links to the Southern Sudanese rebel movement turned political party, the Sudan People’s Liberation Movement, which fought for decades against Sudanese government forces in the context of Sudan’s protracted north-south civil war. The conflict between Khartoum and the SPLM-N erupted in South Kordofan state in June 2011 following disputed results of a state-level election. Violence soon spread to Blue Nile in September 2011, where Sudanese President Omar al-Bashir subsequently removed the state’s democratically elected SPLM-N governor. Khartoum’s forces have also deliberately bombed civilian homes, schools and hospitals in direct violation of Sudan’s obligations under the African Charter, as well as international human rights law and international humanitarian law. Reports from refugees fleeing the violence describe the Sudan government forces’ extra-judicial killings of civilians suspected of having links to the SPLM-N. Indeed, in July 2011, satellite imagery, provided by Enough’s Satellite Sentinel Project, evidenced the existence of mass grave sites in South Kordofan. Because the Sudanese government refuses entry to independent observers, precise civilian casualty figures are unavailable. The United Nations, however, estimates that, since June 2011, more than 366,000 people have been internally displaced or severely affected by the fighting. The US State Department estimates that a further 140,000 have fled to refugee camps in South Sudan and Ethiopia. The assaults on civilian populations have largely occurred during the planting and harvest seasons, severely undermining available food stores in the two states. Exacerbating the situation is Khartoum’s steadfast refusal to permit international organizations to deliver desperately needed humanitarian or food aid to civilians residing in SPLM-N controlled areas. According to the Famine Early Warning Systems Network, areas of southern Blue Nile and South Kordofan are currently experiencing emergency levels of food insecurity, one level short of famine. Notably, Ahmed Haroun, the governor of South Kordofan, along with President Bashir and First Lieutenant-General Abdelrahim Mohamed Hussein, Sudan’s Minister of Defense, are all the subjects of outstanding ICC arrest warrants for crimes committed in Darfur. The ICC’s mandate is currently limited to the investigation of crimes committed in Darfur. Sudan has largely not consented to the jurisdiction of other international human rights committees at the United Nations level. This leaves the African Commission as one of the few forums available for the Enough Project, on behalf of Sudanese civilians victimized by Khartoum, to bring a petition against the government of Sudan for its apparent violations of the African Charter and related international laws. When the African Commission meets, the Republic of Sudan will submit a report on its human rights record. The draft document, recently released, contains not a word about the government’s siege in Blue Nile and South Kordofan. At the same meeting, the commission will consider the Enough Project’s petition, which describes a starkly different reality. The petition provides the African Commission, and the international community at large, the opportunity to examine closely the most recent atrocities committed by the Sudanese government against its own people. Dismayingly, these atrocities are nothing new; rather, they are the latest iteration in a pattern of human rights violations that Khartoum has committed against Sudanese civilians in South Sudan, South Kordofan, Blue Nile, the Abyei Area, Beja, and Darfur since at least the early 1990s. Indeed, the African Commission has previously accepted petitions related to the genocide in Darfur. The time has come for the atrocities and cycle of impunity to end. Asking the African Commission to accept the Enough Project’s petition and subsequently review of the government of Sudan’s actions vis-à-vis human rights abuses in South Kordofan and Blue Nile is a step towards this goal. Mark H. Tuohey is a partner at the Washington, D.C., office of Brown Rudnick LLP, and a former President of the District of Columbia Bar. John C. Bradshaw is Executive Director of the Enough Project, a human rights organization in Washington, D.C.